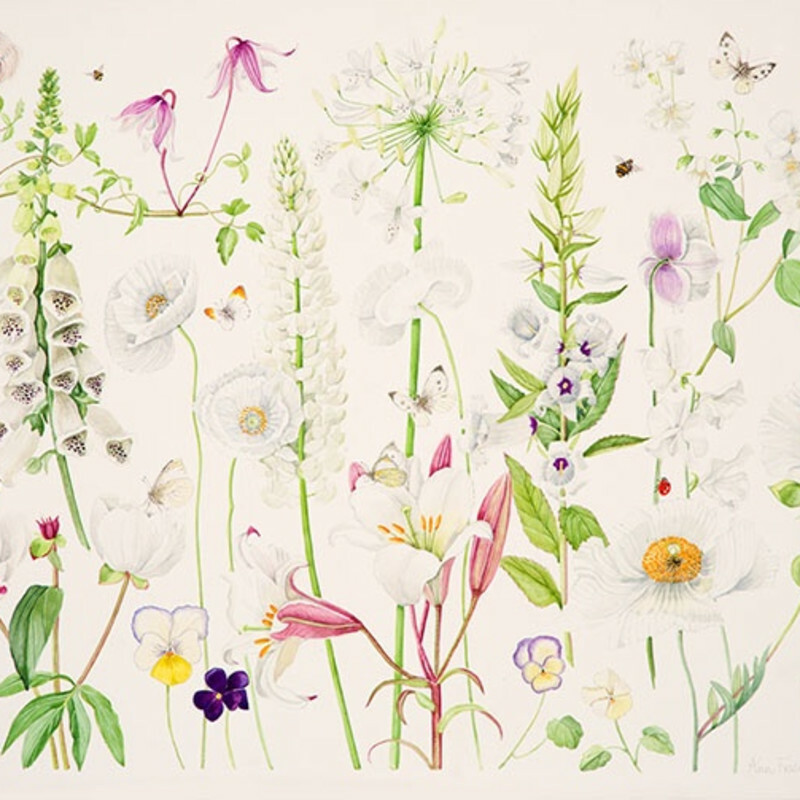 Ann Fraser specialises in watercolours of plants and flowers. She studied fine art at Edinburgh College of Art for four years and then completed her education with a course in botanical illustration at the Royal Edinburgh Botanic Garden. Her paintings have won a series of awards from the Royal Horticultural Society. The inspiration for my painting comes from flowers and plants growing in the garden at Shepherd House, Inveresk, a village on the outskirts of Edinburgh. Every plant and flower is painted from life, true to size and colour. I am not a botanical illustrator, I do not have that scientific expertise but, as Charles Rennie Mackintosh says in his quote ‘I strive to make my flowers as beautiful as they are in life’. I have always loved plants and flowers and hope that my paintings reveal their beauty so others may enjoy them as well. I work through the seasons from snowdrops, hellebores, fritillaries and tulips to poppies and irises. Sometimes when I walk round the garden looking for inspiration, some aspect of a flower or plant will elicit such a strong emotional response that I am compelled to paint. It might be the colour, texture or shape or how it reacts with its neighbour or because the light has enhanced the colour, form or texture. I am attracted to strong shapes and colour and particularly enjoy painting the darker shades of tulips, hellebores and irises. Once reasonably satisfied with the drawing, I then use subtle tones of blue, purple and red washes to build up the colour. I marvel at the wonderful colour of flowers and strive to match the luminosity of the petals and how the light creates a three dimensional effect. I enjoy colour composition both with plants in the garden and in my paintings. I sometimes make up ‘Dream Borders’ which are imagined and don’t exist in the garden but are composed on the page to create a harmonious painting. I don’t have to go far for inspiration. Everything I need is growing in the garden and if the flower dies before I have finished I can readily pick another. As much thought goes into what to plant in the garden as it does planning a painting. Many winter evenings are spent pouring over garden catalogues!